Summer may be over but there is still plenty of daylight for exploring the world-class trails of the Northwest. Below you will find just a few selections – let us know what your favorite hike is and we’ll add it to the list! For the perfect early fall stroll, head to Alki Beach Park, a long beach strip that runs from Alki Point to the Duwamish Head on Elliott Bay. Approximately a 2.5 mile walk, the whole beach offers panoramic views of Puget Sound and the Olympic Mountains. Start at Jack Block Park—drooling over the skyline on the way—then round the point at Anchor Park and make for the Alki Point lighthouse. Follow the small but mighty Coal Creek Trail through a deep ravine, past old mine shafts, rail ties, and other coal-mining remnants from the late 1800s. Now reforested, Coal Creek Park is a rugged surprise among the suburban hills. This first part of this hike can be popular on weekends, but the upper part of the hike is less crowded. The grade is relatively flat—more a place to stretch the legs than to tire yourself out. Grand Ridge Park includes 7 miles through western red cedar trees and is open to hikers, mountain bikers and equestrians. This 1,300-acre wilderness area is located directly north of Issaquah and Lake Sammamish. One of the highlight of the trail is a beautiful 40-foot long, hand-built bridge spanning Canyon Creek. The Granite Mountain Trail is the most heavily traveled summit path in the Snoqualmie Pass corridor. Well worth the heel-blistering 3,800 foot climb in 4.3 miles, you’ll enjoy 360-degree views of Mount Rainier and Snoqualmie Pass on the horizon. Make sure to pack plenty of water, as there is no good source along the trail. Pratt Lake near Snoqualmie Pass is ideal for this transitional season. The Pratt Lake Trail accesses a number of areas and offers an almost unlimited amount of possibilities for hiking, fishing, and scrambling. Roundtrip this is an 8 mile hike through forest and an occasional rocky slope featuring mountain views, wildflower meadows and old growth forest. Located on the west side of the Cascade Mountains, Wallace Falls, features a series of nine falls the tallest at 265 feet. Roundtrip this is a 5.5 mile hike featuring old-growth coniferous forests, fast- moving rivers, mountain views and plenty of wildlife along the way. While the falls are beautiful any time of year, we’re told its best to visit on a rainy day. 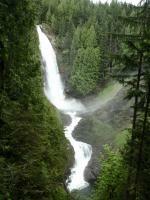 Each raindrop that falls makes its way to the Wallace River enhancing the intensity of the crashing crusades. Grab your hiking boots, water, and possibly a rain coat, and get outdoors before the sunshine is gone for the winter.